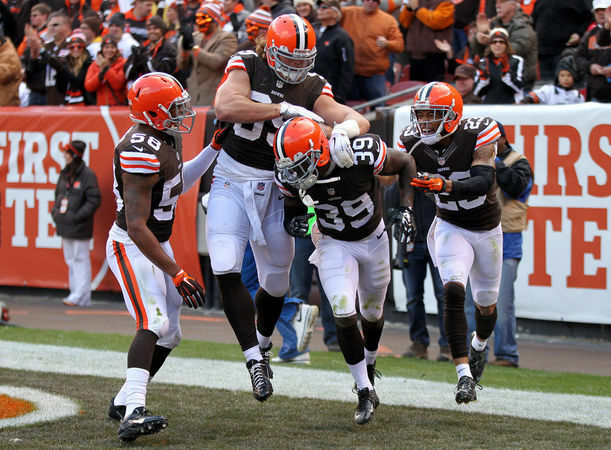 The Cleveland Browns have hit the halfway point of the NFL season with a record of 5-3 after beating Tampa Bay on Sunday. Let’s take a moment to think about what it means for the Browns to have five wins, which on the surface may not sound impressive. But for this franchise? Well, it’s not something we’ve seen very much from the lads in Orange and Brown. This is a team that has not won more than five games since 2007 and, dating back to 1990, has only won more than five games seven times – and four of those came from 1991 to 1994. It may be hard to believe given the way this team has played at times this season – and even harder for some fans to accept for some reason – but this could be the best Browns team since they returned in 1999 (we’ll know for sure over the next eight weeks), and there’s no doubt that Brian Hoyer has been the franchise’s best quarterback in that time frame. The Browns have now won four of their past five games to stay in the hunt in the AFC North Division, and Sunday’s win against the Buccaneers was a perfect example of how this team has transformed itself during the first half of the season. Ever since losing center Alex Mack to injury, the Browns have struggled to run the ball and Sunday was no different as they averaged 1.8 yards on 28 carries. Over the past three games, the Browns have averaged just 1.9 yards per carry, but they have stayed committed to the run, which means that defenses have to at least be aware of the running game, even if they currently do not fear it. The defense continued to make plays on Sunday, sacking Mike Glennon twice and intercepting him twice. And after allowing Tampa running back Bobby Rainey to put up 114 all-purpose yards in the first half (and seeing Twitter turn Rainey into a Hall of Famer who the Browns let get away), the defense remembered that who they were playing and limited Rainey to just seven yards after halftime. Even more importantly, the defense stepped up in the second half, buying time for the offense to get its act together. After allowing a touchdown reception to Mike Evans to give Tampa a 17-16 lead with 2:49 to go in the third quarter, the defense shut down the Buccaneers, limiting them to 49 yards of offense over the final four drives of the game and forcing three punts. That allowed quarterback Brian Hoyer to do what he does best – help lead the Browns to the win – by hitting Taylor Gabriel with a 35-yard touchdown pass with 8:59 left in the game. It was just another week for Hoyer, who completed seven of the 10 passes he attempted that were at least 15 yards downfield for 168 yards and a touchdown, and who has continually posted better numbers in the second half of games this year – the time when it matters the most. 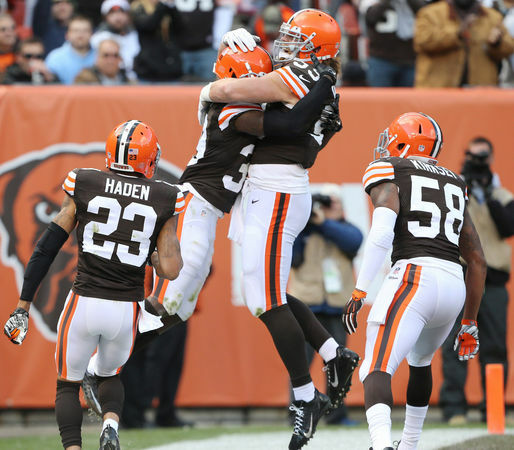 Some will say the Browns won another “ugly” game against Tampa, but when you add it all up – let’s not forget the blocked field goal and blocked punt from the special teams – you realize that Sunday was really what so many of the Browns wins have been this year – a team victory. Earlier in the year, the offense carried the team while the defense was struggling; now it’s the defenses turn to carry the water and they are responding. Football isn’t the kind of sport where a Madison Bumgarner or a LeBron James can dominate the opposing team, but one where it takes a team effort to win and the Browns are exhibiting that week to week. “With every win and with every moment where a guy steps up to make a play, you believe in each other more and it really pulls us together,” Hoyer said after the game. “You never feel like you’re down. The biggest thing for us is, whether it is special teams making plays, our offense or defense, we stick together. For a team whose culture has been losing, I don’t know if a few years ago – and I can only speak for my time here – I don’t know if a Browns team wins that game. We all watch the games each week and we all know the Browns still have problems. Some of the problems are going to be fixed by the return to health of players like Cameron and Phil Taylor, and Gordon’s return from suspension for the season’s final six games. Unfortunately, there may not be an end in sight for some of the problems, most notably at center where Nick McDonald, a week after playing poorly played even worse against Tampa. Sadly, for the Browns and especially Hoyer, Pro Bowl centers are not just walking around on the street, so this one could be problematic through the rest of the season. Despite all that the Browns are 5-3 and have set themselves up to play meaningful games in the second half of the season, starting Thursday night in Cincinnati in the biggest game for the Browns since 2007. If the Browns are going to start to reverse that trend and keep on changing the losing culture that has surrounded the franchise since 1999, it will take a team effort. 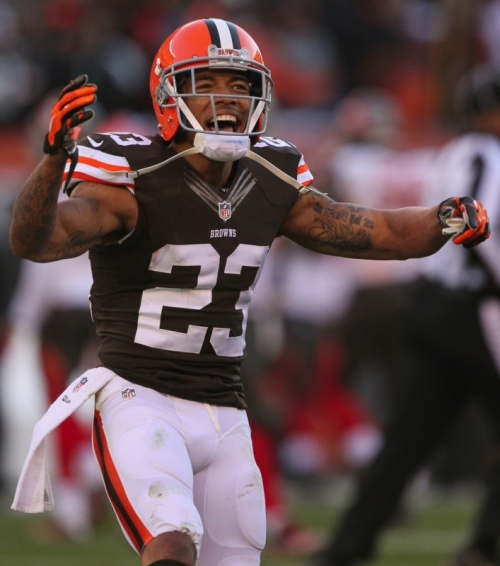 Luckily, that is a concept that this year’s Browns are more than familiar with.